Yesterday, the film world united in one big, “wait, what?,” when the Academy Of Motion Picture Arts And Sciences announced the creation of a new award for “Best Popular Film,” a.k.a. the Consolation Oscar for Dum-Dum Movies. It was a return to the Oscars’ roots, where in 1929 the Academy gave out awards for “Outstanding Picture” and “Best Unique And Artistic Picture”—and then immediately dropped the latter for its second edition in 1930. Of course, comparing the Hollywood of the late ‘20s and early ‘30s to the Hollywood of today is like comparing a Model T to a planet-swallowing shadow monster, not least due to the consolidation of corporate media that’s led to blockbuster factories Lucasfilm, Marvel Studios, Pixar, and Walt Disney Studios all operating under the same corporate roof. 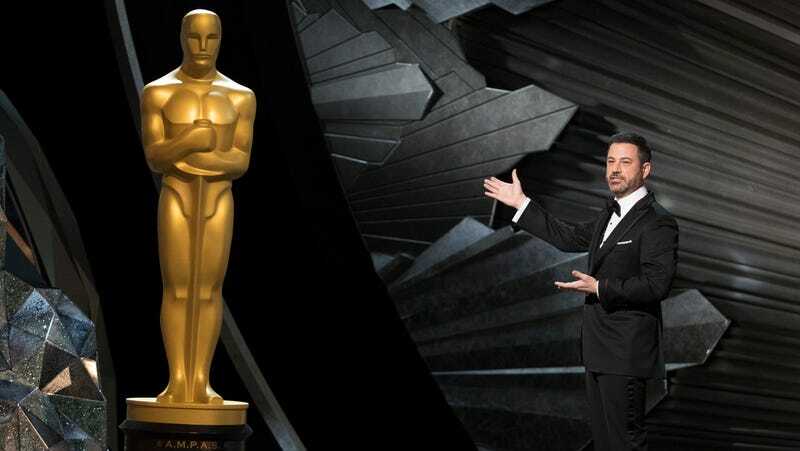 Then there’s ABC, which has agreed to air the Oscars through 2028, tapped late-night host Jimmy Kimmel to host last year’s ceremony—and, oh, yeah, is also owned by The Walt Disney Company. So perhaps it’s no surprise that a Variety report detailing the decision-making behind yesterday’s AMPAS changes says that executives from the Disney-ABC Television Group have been heavily pressuring AMPAS to shorten the ceremony by giving out awards during commercial breaks, thereby leaving more time for sketches in which ABC talent hype Disney blockbusters like this year’s A Wrinkle In Time bit. Said executives also reportedly proposed the creation of a “Best Blockbuster” category, presumably while using words like “synergy” and “brand integration.” Variety also says that “network insiders” at ABC are “unmoved” by yesterday’s backlash, which means you’re going to get a musical number about Disney princesses and C-3PO whether you want one or not. This is Hollywood logic of the sort that got us into this tentpole hellhole in the first place: While it’s true that Oscars ratings have dropped 39 percent since their most recent peak in 2014, 28.8 million people still tuned in to the 2018 ceremony, nearly 10 million more than watched this year’s Grammys and 17 million more than watched the 2017 Emmys. So while the Oscars may have declined in the past few years, they’re still the biggest game in awards-show town, raising the question of why such desperate moves were needed in the first place. Besides, you know, the relentless drive of corporate growth.